Policy-oriented research and unflagging engagement with the community to improve patient care earn Myrna Doumit prestigious AAN fellowship. Dr. Myrna Doumit was the sole representative of Lebanon among the 173 leaders in the nursing profession awarded a fellowship at the American Academy of Nursing (AAN) recently. Associate Professor and Assistant Dean of LAU’s Alice Ramez Chagoury School of Nursing, Dr. Myrna Doumit was the sole representative of Lebanon among the 173 leaders in the nursing profession awarded a fellowship at the American Academy of Nursing (AAN) recently. The recipients of this prestigious distinction were honored at a ceremony held during the AAN annual policy conference, which this year took place in Washington, D.C., in October. According to the AAN, “fellow selection criteria include evidence of significant contributions to nursing and healthcare …. 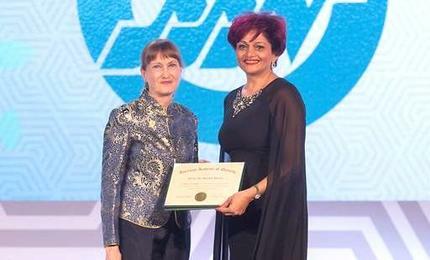 Selection is based, in part, on the extent the nominee’s nursing career has influenced health policies and the health and wellbeing of all.” In Doumit’s case, the combination of policy-oriented research with community engagement and impressive work with the government to improve patient care proved decisive in securing the AAN fellowship. “The alignment of my research trajectory on breast cancer with my community project ‘Courage Against Breast Cancer,’ in addition to my work with the Ministry of Public Health on breast cancer and palliative care, and my work with refugees” sealed her selection by the jury, Doumit says. But more than just formal recognition of the fellows’ already distinguished careers, the position requires honorees to contribute tangibly to the Academy, by engaging with other health leaders to enhance the quality of health and nursing care; promote healthy aging; reduce health disparities and inequalities; shape healthy behaviors and environments; integrate mental and physical health; and strengthen the nursing and health delivery system globally.